Having made our decision to leave Paris today, we made a prompt start and were ready for our pre-arranged 9am lock, despite the odd spots of rain threatening what would be a mast down cruise. We slipped confidently under the bridge pipework with just a few inches clearance and locked down into the Seine to continue our way upstream. 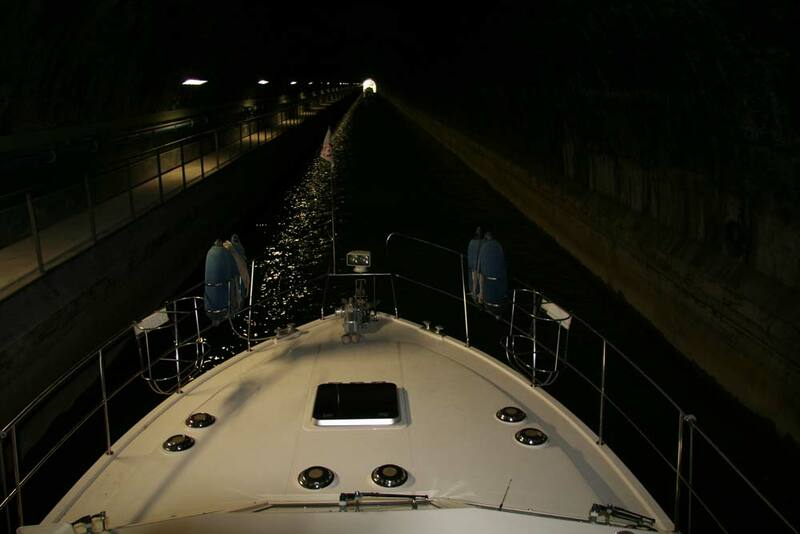 Boats are still in the suburbs of Paris when they turn east off the Seine to join the Marne, and after only the second lock we had our first experience of French tunnels, although with 5.6m of headroom and fluorescent strip lighting, the 600m stretch presented little challenge. The Marne is a wildly meandering river, and many of the more tortuous loops have been bypassed by canals and tunnels, which cuts the cruising time to a very manageable four or five days. As well as the locks and tunnels, there were numerous fixed bridges to negotiate, so we were kept busy measuring the heights and taking photographs for our logs. 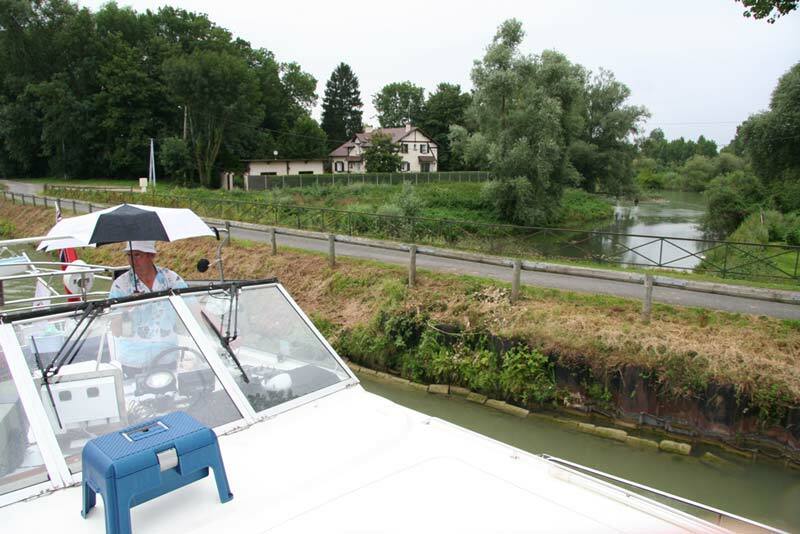 Occasional rain showers made us wonder whether to stop off at one of the many mooring opportunities en route, but we were rather hoping to make it to the cathedral town of Meaux, and as the temperature was still warm, despite the showers, we continued on. A well equipped halte plaisance just downstream of the Meaux locks comes complete with water and electricity, and is free for a stay of up to 48 hours. Not surprisingly then, when we arrived at 5.30pm it was already well occupied with Dutch and German motor boats, who seem to have a sharpened awareness of such facilities. Not a French boat in sight though, as is typical on their canals and rivers. Of course, we found a place to squeeze in, and without having to move anyone which is unusual for us. As well as being a major Brie producing centre, Meaux was distinguished by being a bishopric, and is particularly associated with Jacques Bénigne Bossuet, who became the bishop in 1682 and was famous as a writer, teacher and orator at that time. 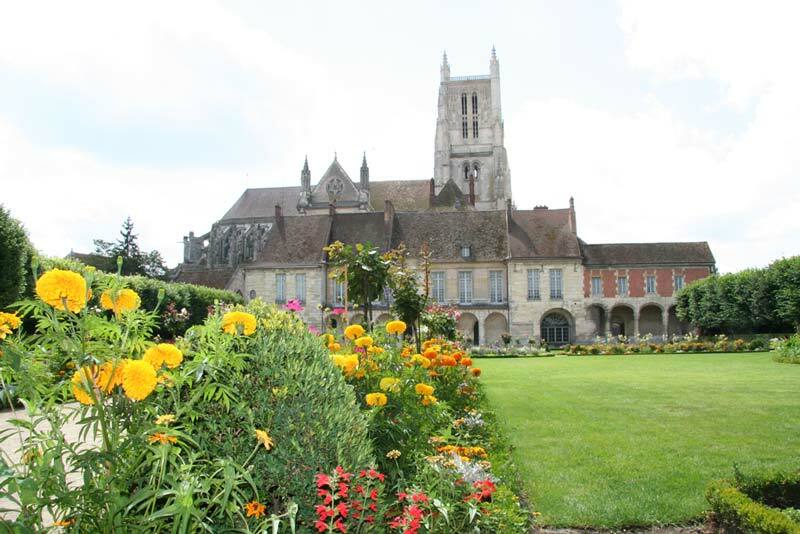 The cathedral, constructed over a period of four centuries, overlooks the Bishop's Palace and a garden laid out, according to local legend, by the famous French landscaper Le Nôtre. The town was a site of the 1914 Battle of the Marne when English troops destroyed one of the arches of the Pont du Marché, and in doing so halted the German advance on Paris.